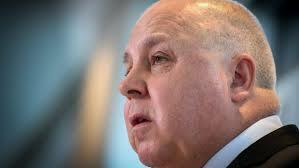 So big is Melbourne's infrastructure boom that Treasurer Tim Pallas fears Victoria will run low on the specialist skills and resources such as gravel needed to make it happen. "We've known for a while that the technical and the specialist skills required for transport projects, particularly rail projects, have been hard to get," he told The Age. "The more projects you start the harder it gets. We've only a handful of rail signallers in the entire state to manage not only the existing network but also the upgrades planned and under way. "That's just one illustration. We are also hearing of shortages in project management, finishing trades, commercial advisory skills, industry analysis, systems engineering and tunnelling. For high-end skills, it's obvious, but its also a problem for entry-level skills." "Only on Friday I was meeting with the extractive industries representative body, and everybody around that table was saying there is so much demand for raw materials, quarry materials, cement and sand and so on that suppliers are choosing which jobs they bid on. "You've got to expect pressure on price." Mr Pallas said that at $9.6 billion per year, Victoria's infrastructure spending program was unprecedented. As a proportion of the state budget it was the biggest since that of the Bolte Liberal government in the 1960s and 1970s that began construction of the Melbourne Underground Rail Loop. Victoria's $9.6 billion per year program was in competition for resources with the NSW $12.1 billion per year program, also the biggest on record. Other big projects in Queensland and New Zealand meant that the market for skills along the east coast was tightening, as it had in Western Australia during the mining construction boom. "We are having to get people from further away and pay them more than we thought," Mr Pallas said. "Ultimately we have to pay what the market is prepared to offer." "Look at what happened with Sydney's Westconnex. The entire industry in NSW put in one single consolidated bid that put the state government at a disadvantage. Here, we are facing the same sort of thing with the North East Link. You can only bring so many people in from interstate. You get to a point where you hit bedrock in terms of imported skills." Mr Pallas said it wasn't yet clear that the pressure on skills and resources would delay or push up the price of any of the major projects. "We are not seeing substantial blowouts. The Melbourne Metro should be on time, we are pretty confident about that," he said. The government's Major Projects Skills Guarantee ensured that at least 10 per cent of the work on major projects was undertaken by apprentices, trainees or engineering graduates. "There are plenty of young people looking for work," Mr Pallas said. "Youth unemployment is still 13 per cent. But what we don't have is a skills base. We need to demonstrate to industry that this pipeline of work is here to stay, that it's not 'here today, gone tomorrow'. We need to make it clear that we are building to a plateau of projects, not a peak." Asked why Victoria didn't simply proceed with fewer major projects so that it wasn't competing with itself for resources, Mr Pallas said that if it did, the resources would go to NSW. "In my own electorate of Werribee we get 100 kids born every week. That's a primary school every seven weeks. You don't get a choice about these things," he said. "There is a capacity across this nation that will either get spent here or somewhere else. We are in something of a war for resources. If I were to say we starting to get nervous about this, it wouldn't be clear we had the pipeline of work and the resources would go elsewhere." Melbourne had an advantage over Sydney in attracting workers because its housing costs were 20 to 25 per cent lower. A guaranteed pipeline of work was attracting former mining construction workers from Western Australia. "The pace is a bit frightening, but it's also a bit thrilling," Mr Pallas said. The buzz and the congestion we are getting on our rail and road network is a direct consequence of all the work we are doing, and also all the work private firms are doing as a consequence. It is building on itself." "We've got problems but they are problems I would prefer to have than those associated with the downturn and malaise Victoria had just four years ago. In February 2013 your newspaper declared that the state was at a standstill. We've gone to the other extreme." "From my perspective I can't take my foot off the accelerator at a time when the community is demanding improvements in their material circumstances." Now they can afford a tax cut?